"Geth" is a special subtype of construct that possesses the robot subtype. Geth are highly advanced robots that utilize a networked consciousness to increase their own collective intelligence. Geth, as individuals, do not possess capability for problem solving or higher thought. But as more geth are present in one location their swarm intelligence increases granting them the ability to fully access the programmed knowledge built into their systems. All geth gain the following traits, unless noted otherwise. Swarm Intelligence (Ex) A geth's Intelligence score is a function of how many geth platforms are present at one time. While geth may communicate over vast distances with their machine telepathy, the benefit of shared computational power when not directly engaged in the same environment is limited. Therefore, geth only gain a bonus to their Intelligence scores based on the number of geth within 500 feet. Consult the table below to determine the number of geth in range and adjust the geth's intelligence scores accordingly. As a swarm intelligence, geth do not utilize skills or feats as normal creatures do. 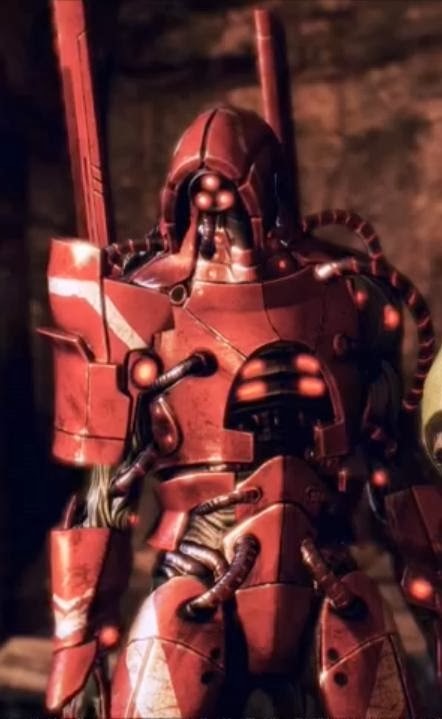 A standard geth has access to a set number of skills based on its maximum potential base Intelligence, detailed under the individual creature's skills entry. These skills represent an average of the myriad knowledge base programmed into the hundred units of software contained in their mobile platforms. However, while apart from other geth, a singular geth unit takes a penalty to all skill checks. Furthermore, each type of geth creature gains pre-determined bonus feats as they are encountered with more of their own kind as outlined on the above table. The specific bonus feats are listed under each individual geth's entry. 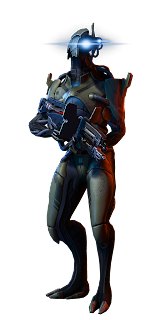 Integrated Weapon Mastery (Ex) A geth utilizes its integrated weapons with expert proficiency, adding their Dexterity modifier to all damage rolls with integrated ranged weapons within the first range increment. Machine Telepathy (Ex) Geth communicate by means of technological telepathy designed into their construct bodies as a means of allowing their conglomerate programs to communicate with other Geth. This means of communication allows Geth to convey complicated concepts instantaneously and have conversations at the speed of light. Self Repair (Ex) A geth's nanites heal it of damage at the rate of a number of hit points per hour equal to its Hit Dice. Six feet tall and composed of sleek, organic-looking mechanical components, this robot has the posture of a human with haunched, dog-like legs. Its head and neck are one long, sinuous appendage covered by a hood of metal sheathing covering a single, glowing lens for an eye. It carries an unusual firearm into battle that appears to be made of black metal with internal lighting. Bonus Feats (Ex) A geth trooper's bonus feat choices are Precise Shot, Rapid Shot, and Deadly Aim. Plasma Rifle (Ex) The integrated plasma rifle interfaces with a geth's mechanical components to power critical systems and assist in cooling. A geth trooper's plasma rifle never runs out of ammo, but after sequential firings must be given time to cool down. Each time the geth plasma rifle is fired, it gains 1 point of heat generation. For every round the rifle is not fired, it loses 2 points of heat generation. If the geth plasma rifle ever reaches 20 points of heat generation, it overheats. If a geth plasma rifle overheats, its wielder must make a Fortitude save (DC 15) or be staggered for a round from the heat discharge through its systems. The rifle must then cool down for 1 minute before being able to be fired again and is restored to 0 points of heat generation. As a plasma weapon, the geth plasma rifle's projectiles are touch attacks and deal half electricity damage and half fire damage. A geth plasma rifle has a range increment of 100 feet and weight 4 lbs. This tall, long-limbed robot is made of sleek, organic-looking components. It walks on all fours like an animal and possesses startling speed and agility. From its central, hooded eye, it projects a sweeping beam of red light that scans the battlefield. AI Hacking (Ex) As a standard action a geth ghost may target any construct with the robot subtype within 100 feet and attempt to assume control of it. If the target of AI Hacking fails a Will save (DC 10 + 1/2 geth ghost HD + geth ghost Int mod) it acts as if under the effect of dominate monster with a caster level equal to the geth ghost's HD. 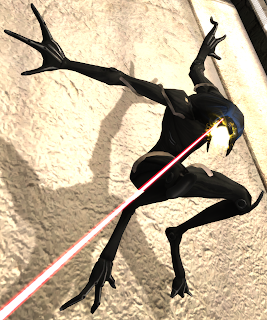 Agile Combatant (Ex) Geth ghosts have a +20 racial bonus to Acrobatics checks and may make Acrobatics checks to jump as if they always had a running start. Barrier Drain (Ex) As a standard action a Geth ghost may target a creature with an active force field. The target of barrier drain must make a Fortitude save (DC 10 + 1/2 geth ghost HD + geth ghost Int mod) or have their force field take 2 points of damage per point of the geth ghost's intelligence modifier. All damage dealt to a force field in this manner is transferred to the geth's own forcefield hp and may raise their force field's total hp over its normal maximum. Excess hp gained in this fashion are lost at a rate of 1 point per round. Bonus Feats: A geth ghost's bonus feat choices are Precise Shot, Rapid Shot, and Run. Tactical Cloak (Ex) As a swift action a geth ghost may become invisible for one round as if affected by vanish. 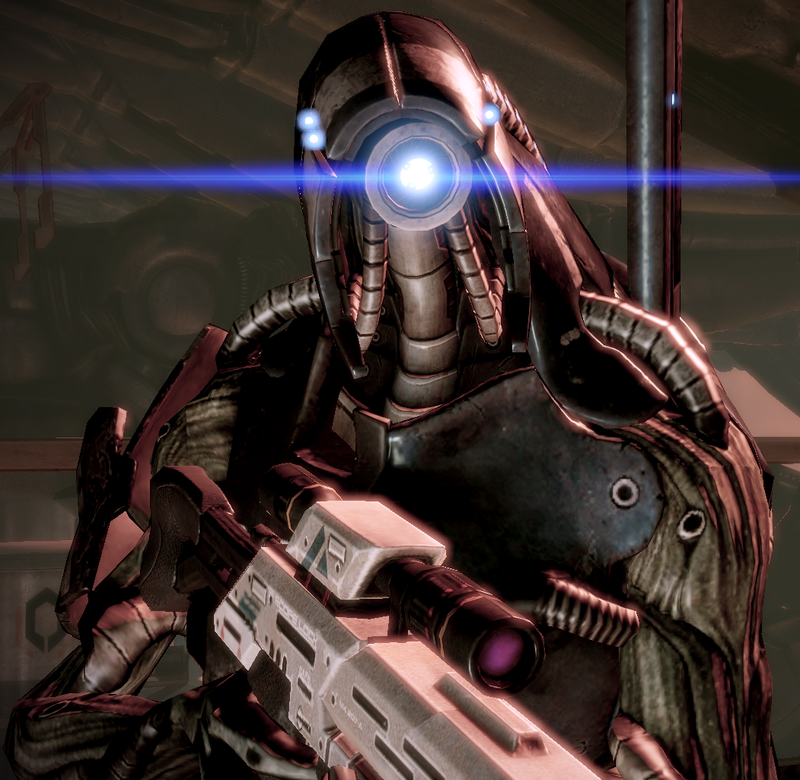 Laser Optics (Ex) A geth ghost's eye is an integrated laser rifle. This weapon has a range increment of 250 feet. Overload (Ex) As a standard action a geth ghost may target a creature within 30 feet and generate an electric pulse around their body. A creature targeted by overload suffers 1d6 points of electricity damage per geth ghost HD to a maximum of 6d6. A successful Reflex save halves this damage. If used on a target with a force field, overload inflicts its damage total on both the force field hp and the target's hp equally. Towering over twice as tall as others of its kind at twelve feet tall, this orgaic-looking robot is covered in thick red armor plating and has three glowing lenses shining the same color from beneath the crown of its hooded head. A low, sonorous hum emits from the construct as it moves, and the firearm it carries looks more like a cannon barely containing a bolt of lightning in the barrel. Bonus Feats: A geth prime's bonus feat choices are Improved Bull Rush, Combat Reflexes and Improved Critical (pulse cannon). Augmented Integrated Weaponry (Ex) A geth prime's integrated weapons may not be used in conjunction with natural attacks and may instead be used with iterative attacks. Combat Drone (Ex) As a move action a geth prime may deploy a combat drone into an unoccupied, adjacent square. A combat drone is a small-sized force effect that acts on the geth prime's turn, similar to the effects of a spiritual weapon spell. The geth prime may direct the combat drone as a free action to move up to 50 feet per round, but the combat drone must remain within 100 feet of the geth prime or be dismissed. Any creature beginning their turn adjacent to a combat drone suffers 6d6 points of electricity damage. A Reflex save DC 20 + geth prime Int mod halves this damage. Once deployed, a combat drone lasts for 1 minute before being dismissed. A combat drone has the stats of a small animated object with the robot and geth subtypes and a fly speed of 30 feet and perfect maneuverability. Coordinated Attacks (Ex) A geth prime boosts the combat effectiveness of all constructs with the geth subtype within 30 feet. All geth within the area gain a +5 competence bonus on attack rolls, damage rolls, saving throws and skill checks. Tactical Cloak (Ex) As a swift action a geth prime may become invisible for one round as if affected by vanish. Rockets (Ex) As a standard action, a geth prime can fire up to three rockets to a range of 800 feet. Each rocket explodes on impact in a 30-foot-radius burst, dealing 6d6 points of fire damage and 6d6 points of bludgeoning damage to all creatures in the area. A Reflex save DC 20 + geth prime Int mod halves this damage. A geth prime carries a maximum of ten rockets. Its core can replenish fired rockets at the rate of one per 12 hours, crafting new rockets from scrap metal and other collected components used in the construction process. Superior Force Field (Ex) A geth prime's force field has fast healing 30.